Does your organization have trouble managing and maintaining its technology? Usually, this responsibility falls to an IT department, but this assumes that you actually have one. Furthermore, it’s easy for an IT department to be so busy with maintaining the state of things that they don’t have time to innovate and improve operations. What’s a business owner to do? Technology isn’t something that lasts forever. It either has to be replaced periodically, or repaired and upgraded to ensure functionality in the long run. Of course, this becomes borderline impossible if the people in charge of IT maintenance must continuously accept phone calls and support requests and constantly put out fires. Eventually, you’ll start to suffer from systems that are inadequate, which creates even more problems. In the end, you’ll just wind up working around issues until they become too severe to avoid. You’ll be forced into two possible situations: 1) Upgrade regardless of what situation your IT budget is in, or 2) Limit your organization’s potential by using inefficient equipment. At this point, you can’t ignore it any longer and you’ll be forced to either upgrade your equipment, or sacrifice functionality. Managed IT to the Rescue! Thankfully, you can keep your technology from even getting to this point by implementing managed IT services. With a managed service provider (MSP), you can make sure that your IT budget never gets busted again by premature hardware failure or unexpected maintenance. MSPs are capable of either supplementing or acting as a fully functional IT department for your organization. If you need IT support, look no further. MSPs can act as a help desk solution. Do you need to implement new hardware? MSPs cover that, too. Whether you want to create a roadmap to implement new solutions, or you want to make incremental monthly investments for preventative maintenance, MSPs can help you improve the way your organization handles IT-related troubles. Furthermore, if you have an IT department that’s overburdened, Computerware can assist them with the needful. If it’s handling support requests or implementing new and innovative solutions, we can help. All you have to do is give us a call. 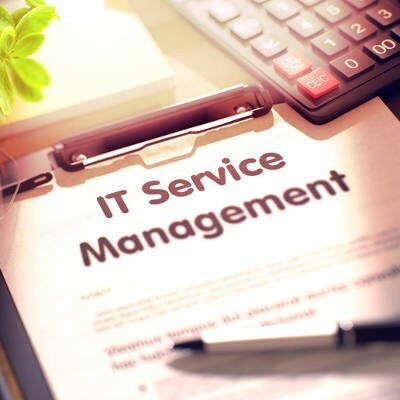 We can work out a service level agreement that details exactly what your business needs, and the rest will be history--just like your IT troubles! To learn more about managed IT services, reach out to us at (703) 821-8200. Technology is an ever-growing part of today’s society, and skilled technicians are always in high demand. Nowadays, technology is so complex that it takes comprehensive and preventative maintenance to ensure that it continues working as intended. Innovators in the IT industry, like ourselves, have adopted a way to handle IT maintenance that helps SMBs like you better leverage your assets. We’ll help your business differentiate break-fix IT from managed IT, and how the latter has significantly changed the industry. The unfortunate truth of the business world is that many professionals who aren’t tech-savvy will continue to use their technology, even though it’s showing signs of degradation. This is a dangerous practice. When technology isn’t receiving necessary preventative maintenance, small issues can blossom into major problems that can no longer be ignored. Some business owners feel that putting off maintenance for as long as possible can save them money, but in the end, it winds up being much more expensive and risky. Let’s use the automobile as an example. It works best when you provide the proper maintenance, like oil changes, tire replacements, and so on. Unfortunately, some people don’t take very good care of their cars, and what happens to them when their vehicles break down? More often than not, they pay a hefty fee for replacement parts and labor. In some cases, they might have to take a loan out to pay for an entirely new vehicle. These are expenses that can be prevented if the car receives the proper care throughout its life cycle. Break-fix IT may be designed to prolong the inevitable, but proactive managed IT services are designed to resolve issues as they become apparent, in an effort to save you money in the long run. Businesses that utilize managed IT services tend to outsource the responsibility of maintaining IT systems to third-party providers. The goal is to avoid major technology problems by resolving minor issues. For example, taking proper care of your server units and workstations can improve their lifespan, which means that you won’t have to replace them as often due to hardware failure. Business owners have a lot on their plate, and they often don’t have enough time in the day to accomplish all of their goals. One of the biggest advantages of utilizing managed IT solutions is that you get back all of the time that your team would waste on wrestling with your technology solutions. Plus, replacing a critical piece of hardware before its time is up can be crippling to your budget, making it far more cost-effective to prevent problems rather than continuously replace failing technology. Basically, the big difference between break-fix IT and proactive managed IT is the fact that you’ll be dealing with fewer technical hiccups due to regular maintenance and management. This leads to more uptime and more cost savings, allowing you to focus on what matters most: running your business. If your team is ready to improve the way you handle technology, or you’re just sick of dealing with faulty equipment, Computerware can help. Our technicians can provide expert advice and care for your technology. To learn more, give us a call at (703) 821-8200.